The MESA® EL-84 / 6BQ5 is the little brother to the EL-34 and is the classic European-designed tube that lead the original British invasion. Our EL-84 offers tight and punchy bass, smooth and warm midrange, and an amazing chiming upper-mid and sparkling top end that is always inspiring to play!. Brilliant focus with a frequency response that always brings your guitar to the front of the mix, this EL-84 is true to its classic roots. MESA power tubes are among the highest quality available and selected for their exceptional full-range tonal quality, consistency and reliability. 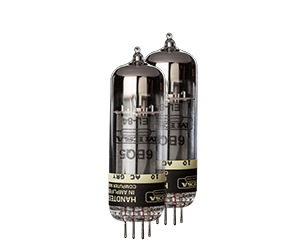 All MESA tubes offer unsurpassed consistency and reliability for ANY tube amplifier, and certainly MESA amplifiers! Remember… our dedication is to create the world’s finest tube amplifiers. And to achieve that goal requires a deeper commitment to tube quality… because the reputation of our amplifiers depends on it.